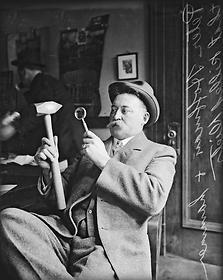 Hoffman (1863-1948) worked as a grocer and a railroad clerk before his election as Cook County Coroner in 1908. Indicted on corruption charges in 1925, he retired from politics the following year, after serving six months in jail. Medical examiner: An appointed medically qualified officer whose duty is to investigate deaths and bodily injuries that occur under unusual or suspicious circumstances, to perform post-mortems, and sometimes to initiate inquests. Coroner: [related to Anglo-French corouner, from coroune, meaning crown]: An officer of a county, district, state, or municipality; originally, in medieval England, an official who upheld the monarch's rights of private property. From the 16th and 17th centuries on, the chief duty of the coroner was to hold inquests on the bodies of those believed to have died by violence or accident, or who suffered grievous bodily harm. In modern times, in the United States, the coroner is an elected official. For more historical information, see "Coroner," Encyclopedia Britannica, 1911 ed.